This is an intensely rural part of Norfolk, stunningly green, and never more so than on a cold, bright early autumn day. 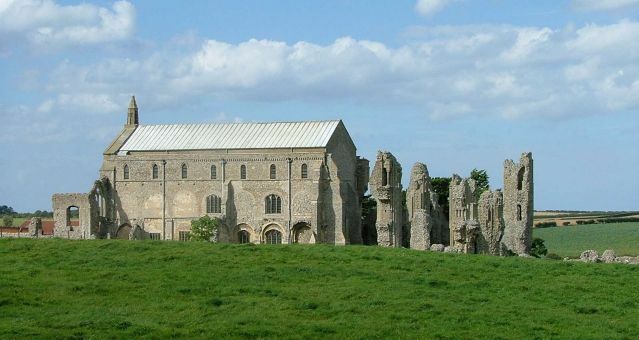 The buildings feel like intrusions in an agricultural landscape, and the ruins of Binham Priory seem a precursor of what one day will happen to all of them, to all of us. And yet, the wide landscape seems to say, the world will go on, and all will be well, and all manner of things will be well. The cows in the field around the ruins were mostly sitting down, which I took to mean rain would not be long in coming; but some were standing, and in any case we saw no rain that day. Perhaps they were just very laid-back cows. The medieval dedication of this church was to the Holy Cross, but the priory was dedicated to the Assumption of the Blessed Virgin, one of Mary's five feast days, and today the church follows the Priory's example and is simply 'St Mary'. The church was the Priory church - or, more accurately, the nave of the Priory church, for being a Benedictine foundation this was the part that the parish used, which is why it has a font, and why it survived when all around the other Priory buildings fell into ruin. The Priory church was once very big indeed. This nave had aisles (you can see the remains of the walls outside) and beyond the present east end there were two transepts with a vast crossing, and a very long chancel with a large lady chapel to the north of it. The present east end was created by building up the pulpitum that separated the nave from the crossing. The aisles were probably blocked off by rubble in the arcade, although the north aisle apparently survived until a general restoration of the early 19th century. This was the time the tracery in the west window was largely bricked in, but it had probably been falling to pieces for years. The tracery that survives is well worth stopping to look at. We can date fairly precisely from contemporary accounts that the west end was built in the first half of the thirteenth century. If this is the case, then what we have here is an extremely early example of bar tracery. This may sound a mere detail, but it is actually very important. Bar tracery had first appeared earlier in the century at Rheims Cathedral, and enabled a great flowering of artistic style. Lighter and easier to manage than the old plate tracery, it led to the development of Decorated architecture. Westminster Abbey has surviving Decorated tracery from later in the century, and there is some evidence that Decorated windows were installed at Lincoln Cathedral and Windsor before those at Binham, but are now lost. It may seem strange that the new French style made itself known here before almost anywhere else in England, but we have to remember that Binham is close to Blakeney Haven, one of the great East Anglian ports of the Middle Ages, and is en route from there to Walsingham, one of the two great pilgrimage sites of Medieval England. This must have been a cosmopolitan place in the 13th century. You step in under the west front, and the walls of the narrow nave rise up into the roof on either side, their arcades, triforia and galleries of cathedral-like proportions, quite unlike any other East Anglian church. Before you is the seven sacraments font, and beyond a few benches before, all too soon, the sanctuary. It is a building that seems to defy conventional proportions. The font is a good example of the seven sacrament style, rather better than the one at nearby Cley. The Confession panel is particularly splendid: the Priest hears confession on the right as an angel watches; the waiting penitent on the left is still in the grip of a devil. I also love the eighth panel, the Baptism of Christ, which features a peculiarly pot-bellied Christ. As at Cley, the Confirmation panel shows a Priest (not a Bishop) confirming a babe in arms. The Mass panel still bears a striking (if you'll excuse the pun) rectangular hammer blow. As at Cawston, the supporting angels hold symbols of the sacrament in the panel above. Eight apostles flank the column. Binham's other great treasure is the surviving screen dado, now behind glass on the south side of the church. During the reign of Elizabeth it was whitewashed and overwritten with biblical texts, as we must assume so many were - even if the figures were not idolatrous, protestants have never been comfortable with portrayals of the human body. However, over the years the whitewash has flaked off, and the figures have begun to show through. Thank God that nobody did a 'proper' repair job and removed the whitewash! They are absolutely haunting, the figure of St John particularly so, and say something to us now about resilience and the eternal. The original metalwork of the rose window survives, and now hangs on the inside of the west wall. The bench ends should not be overlooked, as they are of extraordinary quality, despite damage. One of them shows a lily, possibly a rare image of a lily crucifix. My favourite is the babe in swaddling clothes - very moving. I wasn't convinced that they exactly fit here, although they may not have come from the nave originally, of course. Finally, a bearded man under a misericord, looking more like a Greek god than anything the English might have held dear in their hearts.